Does Pump Core Work to Build Muscle? The ultimate body may be the single hardest thing to attain in this world. With all of the barriers that stand in our ways from cheap, nutritionally challenged processed foods being pushed in our faces to poor environmental conditions both indoors and outdoors in many areas to a computer culture that attempts to make us all more sedentary than ever building our bodies has been harder than ever. Still, all these challenges and others can be overcome with a pure desire that the most dedicated possess. But, as any true athlete knows, desire is not the only thing that they need. They also need every edge they can get to be able to climb the mountain of obstacles that has always existed and has only become harder in this modern age. It's not enough to have a top performance workout routine, a completely rejuvenating recovery method and an awesome dietary plan; it's also critical to incorporate a top notch supplement that provides the kind of energy and crucial elements that are needed to overcome the problems that have always existed and have only gotten worse. These supplements such as a pre-training energy booster are an increasingly important part of any bodybuilding regimen and no one should even consider going for the ultimate body without one. The only real problem is in trying to determine which of the seemingly hundreds of options on the market is the right one for you. And, as anyone who has already started searching for one has discovered this process can be quite confusing once they realize that most of them have very similar ingredients and make nearly identical claims. This being the case, we, as part of our ongoing efforts to help our readers find the products that would work best for them, have decided to take a long hard look at one of the most talked about pre-training supplements out there - it's called Pump Core. Based in the UK, FA Engineered Nutrition is a relatively new company to many potential consumers in the US but they do have a number of products that have been rated as good to even better than good in other markets. 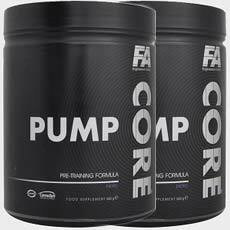 As for Pump Core Pre-Training supplement there are many questions concerning its ingredients and formulation which need to be answered. An examination of the list of ingredients reveals an improvement in the content of CarnoSyn and hydrolyzed casein over previous versions. On the surface this newer version is much better suited to provide the raw essentials necessary for a full tilt workout that will likely lead to a session that will produce the maximum possible benefits. They include, in part, a number of critical vitamins and minerals such as Vitamin C, Niacin, Vitamin B6, Vitamin B12, Calcium, Magnesium, Potassium, Beta Alanine, Citrulline Malate, Arginine AKG, Di-Arginine Malate, Arginine HCI, Taurine, L-Leucine, L-Isoleucine, L-Valine and Hydrolyzed Casein. Looking at information provided on the official website for Pump Core and other online retail outlets that offer Pump Core one can find a number of references to research or other data that purports to support the effectiveness of this product but these references generally speak to the effectiveness and history of the individual ingredients. This is an issue because, as any knowledgeable consumer of these types of products understands that it is not the ingredients themselves that matter in a products' overall effectiveness but the formulation of those ingredients. This is because, although a product may contain a number or quality ingredients, it is the way they are formulated that ends up dictating how effective the product actually ends up being. Most manufacturers of products of this nature generally tend to post testimonials or user reviews that highlight the positives for the product. Being that these testimonials are obviously biased in their nature we tend to look for more independent sources of user reviews. A standard search of the internet for industry related websites with no known affiliation to Pump Core or FA Engineered Nutrition and a number of internet chat rooms focused on the subject of bodybuilding supplements brought up a significant number of user reviews for this product. Looking at the aggregate it is clear that a wide majority of these independent user reviews had a negative to highly negative view of Pump Core. The most widely used theme among these negative reviews was that this product did not perform up to the standards put forth in its claims. Moreover, many reviewers stated that Pump Core did not compare well with some products these users had tried in the past. A look at the ingredients used in Pump Core there is no reason to believe that they pose any serious health risk or offer the potential for allergic reactions in users with no significant health issues. That said, it is always advisable to seek a consultation with a primary care physician or other qualified medical professional before starting use of this product or any other similar product. The average cost of a one month supply of Pump Core is $37.76. Users should use two scoops of the powder and mix with 250ml of water before, during or just after the workouts. At the top of this review we discussed the fact that the ultimate body may be the hardest thing to attain in the world. The dedication and preparation involved is nearly unmatched in the things that man can pursue. And, when it comes to choosing the right workout regimen, recovery methods and dietary plan there are so many things that can go wrong. So, when it comes to making these critical choices choosing wisely is of the utmost concern especially when it comes to the one thing we have not mentioned here - a bodybuilding supplement. Unfortunately, making this choice can be as hard or even harder to get right than the other aspects of a bodybuilders overall methodology. This is because there are seemingly hundreds of options out there with incredibly similar ingredients and even more similar claims. Looking at the merits of Pump Core in particular there are a few points that need to be taken into consideration in order to know whether it's the right bodybuilding supplement for you. The first point is that the list of ingredients is absolutely comparable to many of the most highly rated supplements. The second point is that, because the formulation of the ingredients is far more important in determining the effectiveness of a supplement than the ingredients themselves, there is little credible data from research, clinical studies or trials that supports the effectiveness of the formula. In taking the first two points and adding a third which is that a wide majority of the independent user reviews that we were able to find expressed a highly negative view of their experience with Pump Core. Taking all of these points together there is no real way that any serious reviewer could find a way to rate Pump Core among the top rated bodybuilding supplements.